Sharks. I’m not sure why I am completely fascinated by these misunderstood animals. They capture me with their stealth, beauty and elegance. The fact that we know almost nothing about these animals – how long they live, where they go to breed etc – only attracts my interest further. I remember when I was very young and taking weekend visits to the Video Store, picking out movies our parents wouldn’t want us to watch, but our Grandparents would. I picked up the Jaws video. Being so young, this movie was terrifying and for a long time I was honestly very nervous and scared to swim in water I couldn’t see the bottom of. Silly right? Thankfully I’ve now overcome this through my love of Scuba Diving! Since then my fascination with sharks has just increased, from documentaries to swimming with them they are incredible creatures. As I grew up and learnt more, visits to our local Aquarium became frequent. I would go round-and-round the underwater tunnel. Running up and down to follow the ‘Giants’ as they swam by – not the kind of Giants I would go on to watch – I was fascinated the more I learnt, even with the smallest of Shark Species. So, to be flying down to Cape Town, the home of Great White Shark Cage Diving. Was a dream come true and I couldn’t wait to jump into the water and see these amazing creatures in real life! Arriving into Cape Town marked the end of our G Adventures Tour through three countries of Africa. It marked the end two weeks camping, cold showers, mosquito bites and sleeping bags – which was great because we had lost one along the way. – Staying with Family friends had its perks. It was important for me to have the most ‘authentic’ experience with the sharks. I didn’t want to be on ‘one of many boats’ dropping cages and the Sharks emerging because they knew they would be fed – fed with fish, not people, just to be clear – this ruins the experience and shouldn’t be encouraged, in my opinion.Marine Dynamics was my choice of ‘Tour Operator’, they are passionate about what they do, knowledgeable, work within conservation/protection and all round fantastic. The pick up was early thankfully we were last to be picked up, so it was a straight drive to Kleinbaai. On arrival at the ‘Great White House’ we were treated to hearty breakfast and mingled with the other divers/staff that would be travelling with us that day. It was awesome to mix with everyone and the biologists before heading onto the boat, I wanted to know everything. I was like a kid going to the Zoo for the first time. I had so many questions and I was so excited I could barely contain myself! The wonderful guys at Marine Dynamics were on hand to answer every question I had while topping it off with extra facts, keeping my curiosity fulfilled. Suiting up and boarding the boat, speeding off into the ocean. My eyes were peeled, scouring the ocean for a fin.My naive mind half expected them to be easy to find. I kept finding my eyes would play tricks on me and my heart would jump again and again. Once we had stopped,the smell of the concoction of fish chum juice was being chucked into the Ocean and we waited. The cage was lowered. Then all of a sudden, Fins! I spotted my first shark! In the distance, the tail fin and the dorsal were cruising out of the water riding a wave towards us. My heart missed a beat, that shark was far away and still looked big. Great White Sharks are definitely a lot bigger than I expected. At this point I wasn’t sure whether I was terrified or excited. The fake seal cut out was in, we waited for the sharks to get closer and start interacting with us. The sharks are never fed, only interacted with the fake seal and enticed with the smell of dead fish. Spotting the shark from the top of the swaying boat was so exciting. I was gripping the bars. Eyes wide in astonishment the first thing that went through my head was, they’re not that big, I thought they would be much bigger. I mean they are big but not Jaws size big. Crazy how much an old fashioned movie can influence you! 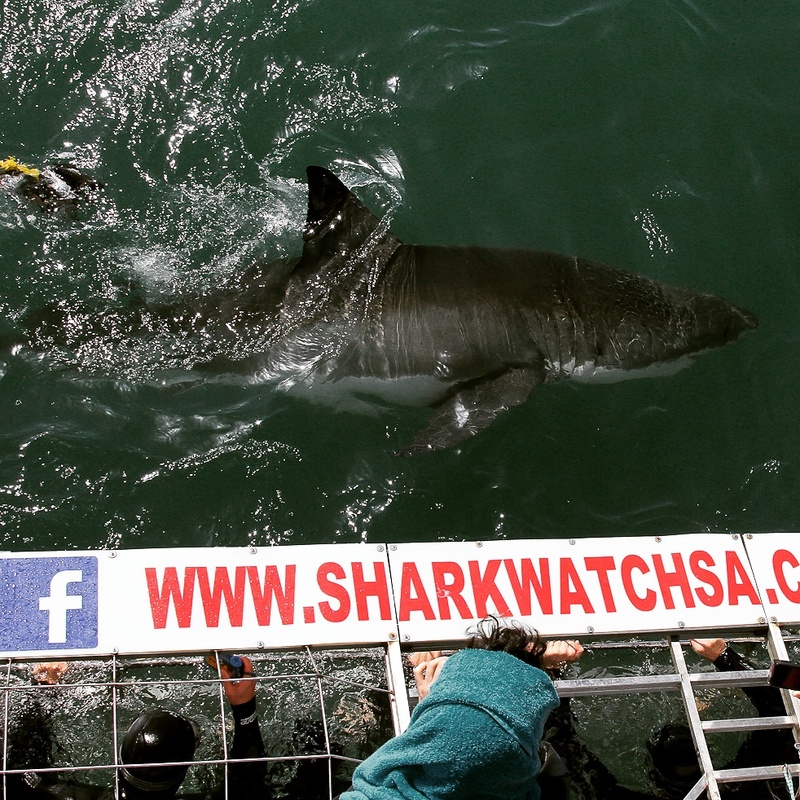 Once the cage was secure, it was time for the first few volunteers to start their Great White Shark Cage Dive. They weren’t short of people, everyone jumped at the chance of getting in the cage first, apart from me. I wasn’t backing out, being at the top deck meant I had an amazing view of the sharks in action. I wanted to watch these amazing creatures. – i also didn’t want to sit in a cold wet suit for the rest of the dive. Standing next to a volunteer marine biologist had it’s perks. I got so much information as he was telling me the names of the known sharks, it was fantastic. Once it was my turn to get in I was so excited. Marine Dynamics don’t kit you out with Scuba Gear for the cage, you have a wet-suit and a mask. The cage itself floats above the water so you can keep your head up and breath. When the shark is spotted from the boat the crew shout ‘Down, Down, Down’. You use the cage bars to push yourself down. There are handles on the inside to hook your feet into to keep you under. Great White Shark Cage Diving was an amazing experience, being in the water with these powerful animals was inspiring! To see how well they blend into their environment, although you can see them clearly above the water. Once in after a few feet they fade into the ocean colors. They really are top predators but not as scary and terrifying as I’d expected. My first dive was intense and thrilling. Then it was time for the last dive and I asked to stay in. Which was great because the biggest shark was yet to arrive! The Shark that appeared last was a big female who was also pregnant. Longer than the cage, uninterested in the fake seal, she took the time to swim back and forward inches from our cage. Her big eye wide as she took the time to check us all out, curious at what we were doing in her ocean. This was my highlight from the great white shark cage dive experience. Seal Island is really, covered in Seals! Once the dive time was up we were lifted out the cage, offered snacks and got changed while the crew loaded the cage away. It was time to sail back in to shore and leave the sharks alone. On the way back we stopped off at the famous Seal Island. Usually featured on National Geographic, this is the spot to come and see sharks jump out the water at high speeds. Known locally as McSeal Drive Through, bad taste I know! There are hundreds of seals here, some with pups and others heading our to hunt. The water is clear and you can see right down. The seals below playing in the seaweed and searching for crabs. The tide was low when we went through, it was still early for the sharks to be out hunting. So we didn’t see any jumps, but the seals were entertaining. I don’t think anyone would have been ready to see the sharks attack them. Especially after we had such a beautiful experience with them. For those suffering from sea sickness, this visit does not help at all. So get your sick backs and preferred side of the boat ready! After The Dive & Back on Land. Once back on land everyone helps take some gear off the boat, including their own, back into the store. There’s an area to get freshened up before grabbing a table and lunch is served. Ginger beer is offered to those poor folk suffering sea sickness and it was soup and sandwiches all around. As we all sat and chatted excitedly about the day, they played a hilarious video of the day. The staff had such a buzz about them as well which just made the atmosphere better. Once lunch was finished, they gave us more information on what they do to help the sharks. How to protect the environment and how we can contribute. One of the ways they are protecting the sharks is essentially buying the ocean. Piece by piece, with everyone’s help to turn those zones into a protected area. So of course I offered some to help contribute to the program. Great White Shark Cage Diving, I would recommend to anyone who wants to get up close with these animals. Just make sure to choose a good company! Marine Dynamics were fantastic to dive with. The passion of the staff, knowledge and excitement they have is intoxicating and really made my day that much better. I couldn’t recommend them enough! It was the perfect way to finish my African Adventure. I will be back one day to get up close and personal again, one time just wasn’t enough! Wow this is an awesome experience. My boyfriend wanted to bring me to do it in Australia but I was too much of a chicken! Next time it is!